Have you ever wondered how other clubs manage their activities? This presentation will fly through the Mobius Investment Club's set of activities: portfolio, strategies, stock selection, investments, membership, meetings and much more. All illustrated and spiced up with numbers, facts and figures. 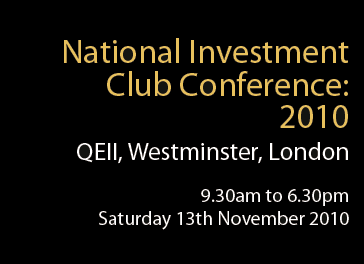 This should provide delegates ways to relate some of these to their own investment clubs to contrast and discuss. Pundits advocate a variety of different approaches to investing, each of which has its place. Peter will introduce a selection of the most popular ones. He explains what lies behind income, growth and value investing, and whether it pays to be contrarian, so that you can choose the approaches that are best for your investment club. Check out www.investorschronicle.co.uk for more investment tips and analysis. Dary will demonstrate some simple technical analysis techniques and show you how you can learn from the past to optimise your strategies and increase your stock market profits. From Chaos To Cash: An in depth exploration of underpants, watches, marriage, cities, pendulums and the stock market. Amongst the money changers, Paul in previous years has demonstrated how spinning a coin is a better predicator than the experts and why the mind is designed to lose in the stock market. Founding father of UK Investment Club movement. An interactive panel discussion. Our experts will answer audience questions about any aspect of running an investment club and discuss their experiences over the last year: what went wrong, what went right, what we would have done differently with hindsight and what we can learn going forward. If you would like to get involved in helping to organise or are interested in speaking at any investment club events, then please Contact Us for more information.